Bobbi picked up three stray and abused cats: Olive, Bruiser and Pumpkin. She'd loved animals since she was a kid in Hawthorne, a suburb of Los Angeles. 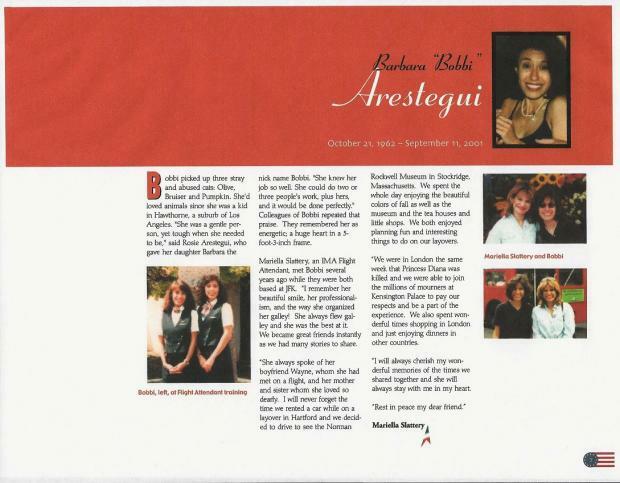 'She was a gentle person, yet tough when she needed to be,' said Rosie Arestegui, who gave her daughter Barbara the nickname Bobbi. 'She knew her job so well. She could do two or three people's work, plus hers, and it would be done perfectly.' Colleagues of Bobbi repeated that praise when Wayne met them in Boston on Friday. He talked with more than 50 people who knew his girlfriend through work. They remembered her as energetic; a huge heart in a 5-foot-3-inch frame. Bobbi and Mariella Slattery, an IMA Flight Attendant, met Bobbi years ago while they were both based at JFK. “I remember her beautiful smile, her professionalism, and the way she organized her galley! She always flew galley and she was the best at it. We became great friends instantly as we had many stories to share. “She always spoke of her boyfriend Wayne, whom she had met on a flight, and her mother and sister whom she loved so dearly. I will never forget the time we rented a car while on a layover in Hartford and we decided to drive to see the Norman Rockwell Museum in Stockridge, Massachusetts. We spent the whole day enjoying the beautiful colors of fall as well as the museum and the tea houses and little shops. We both enjoyed planning fun and interesting things to do on our layovers. “We were in London the same week that Princess Diana was killed and we were able to join the millions of mourners at Kensington Palace to pay our respects and be a part of the experience. We also spent wonderful times shopping in London and just enjoying dinners in other countries. “I will always cherish my wonderful memories of the times we shared together and she will always stay with me in my heart.